Rick Remender’s run with Captain America has really paid off for me in the Marvel NOW!. So I was really anticipating Captain America: Loose Nuke with my biggest question being would Cap be impacted by his time in Dimension Z? I really want to know. And Remender does not wait long for us to know that Captain America’s decade long struggle in Dimension Z left lasting scars. Captain America has returned to our dimension and Earth. But the cost of his return is heavy. S.H.I.E.L.D. is able to confirm that Cap has been gone a decade, but they have concerns about his newest charge Jet Black since she is the child of Armin Zola. 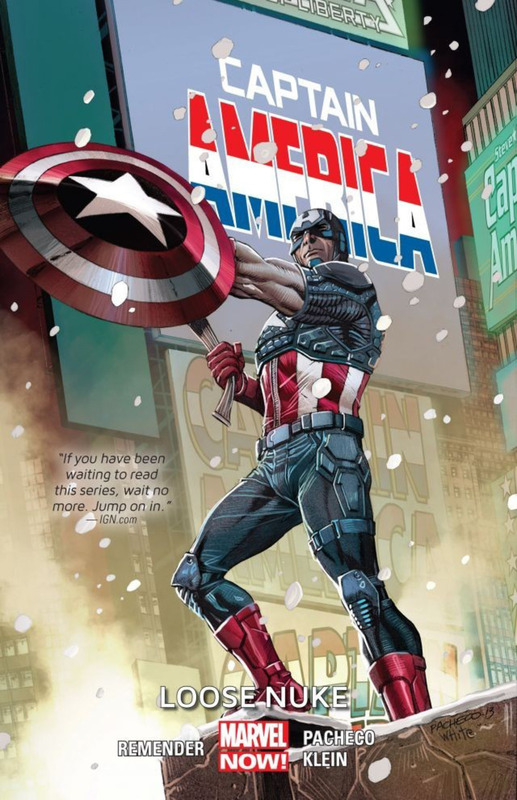 While Cap attempts to reintegrate into the world, with his time away yet again making him a man out of time, a former American super soldier named Nuke resumes the wars that America lost. Rogers overcomes his physical and deep emotional loses to face Nuke on the battlefield as American symbol faces down American symbol. But is Nuke’s battles as patriotic as they appear? He is controlled by a General, who may have links to S.H.I.E.L.D.’s past reaching back to 1969! I do not believe I have ever seen Cap shattered like this. He really needs counseling. His time in Dimension Z has scarred him and clearly he has some variety of post-traumatic stress disorder. And who can blame him. His time in Dimension Z may have been short in our time but he lived for 12 years not as the symbol of America but as father trying to keep his little family alive. And the whole incident created giant losses for him that no one will be ever able to replace. He attempts to find his solace in two projects. First, he has brought Jet Black back with him to our world. And he hopes to give her a better life than she would have had as the Queen of Dimension Z. And Jet needs him to help fill her own losses. But it is a precarious situation as the young lady was raised to be a tyrant not the next version of Captain America. Second, he has the mantra of let go of the past. Honestly, I do not believe he should. His past has given him a new strength he never had before. Perhaps Cap and Nuke need to not let go of the past perhaps they both need to move into the future while honoring their pasts. I have never really been a Nuke guy. He has always just seemed like a lot of shooting, a dumber Punisher. But Remender has made him very smyptathicc to me. Nuke really does care for his brothers in arms. And the super-solider recipe used on his has forced compliance. As a reader I came to understand this version of Nuke and really felt pain for his misery and plight. Agent Ran Shen made his debut in this arc. There are flashbacks to 1969, showing a much different Ran then we see in Winter Soldier: The Bitter March. This Ran is bitter, angry, perhaps a little broken and not at all the Sean Connery version of Bond we are seeing in the mini-series. I did have to chuckle as Ran yells at Winter Soldier in 1969 that ‘You’ll never obstruct me again, Winter Soldier!” And this makes me wonder if Agent Ran will not retrieve the Alchemy Formula in the final issue. I wonder if we will see instead a step towards his evolution as the villain Iron Nail. I love what Rick Remender is doing with Captain America. You really should check it out if you have not already. This Cap is not unshakable, but is instead remarkably human. He is a hero with scars and we can relate to him!